Prepare yourself for the next step in your journey towards a complete digital workplace experience. Valo Intranet allows you to fully utilize everything that Modern SharePoint offers - and much more! Valo Modern is the latest addition to Valo's ecosystem - including Intranet, Teamwork, Idea Management, and Mobile App. Built 100 % on top of Modern SharePoint, Valo fully leverages all Office 365 capabilities to deliver extra value to users and content creators. Your new intranet will be beautiful, mobile friendly and easier to use than ever before! Here are just a few of the highlights that make the next generation of Valo Intranet the best choice for your digital workplace. Ensure your intranet stays relevant and engaging by targeting your news to specific users based on profile or metadata. With security trimmed navigation, you can rest assured your users will only see what they are targeted to see. Valo enhances the overall user experience by providing simplified content management, while at the same time, embracing all the innovations coming out of Office 365. With breadcrumb controls, fully secured mega menu and big footer, you will find what you are looking for at a glance. Create visually beautiful, branded content and change the look in no time! Switch the color and the way the content is structured with only a few clicks. Ensure consistent branding across communication and collaboration sites with full components branding and multiple-brand support. Create new content inside Communication Sites and Modern Team Sites quickly. No matter where you're currently on your site, you can create articles under different topics using Valo's Toolbox and pre-defined templates. Translate your news manually or create full, machine translated versions in a matter of seconds. Then, publish them on a local site without leaving the original page inside your multilingual intranet. Valo Intranet supports +20 languages, with more to come, and Valo Modern will be available in several languages by the end of 2018 including Finnish, German, French, Dutch and Spanish. Want to see Valo Modern in action? Rather than the technology, focus on what is important - creating an open corporate culture and building a community for a better workday experience. Choose our ready-made Valo Modern solution which follows Microsoft's latest recommendations and is designed by agile development teams together with MVPs, Valo Partners and early-adopters. 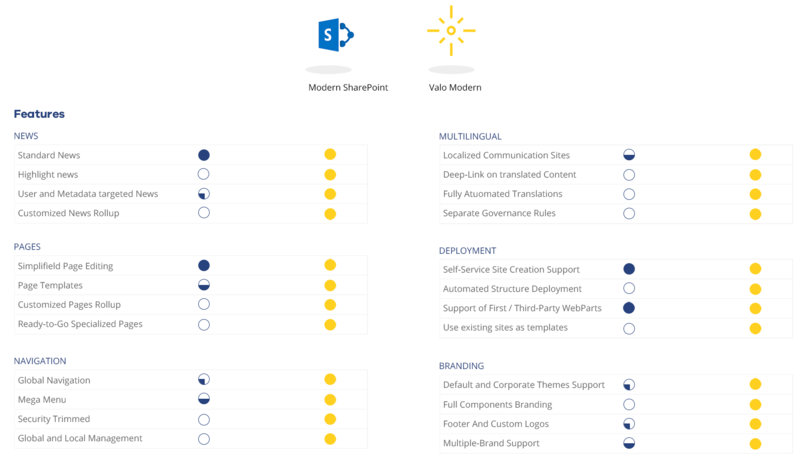 Valo Modern is the first intranet in-a-box solution built 100 % on top of Modern SharePoint. To see for yourself how extremely easy it is to use, book a demo with us!
" When we first heard about modern SharePoint I was amazed at how mature it had already become. 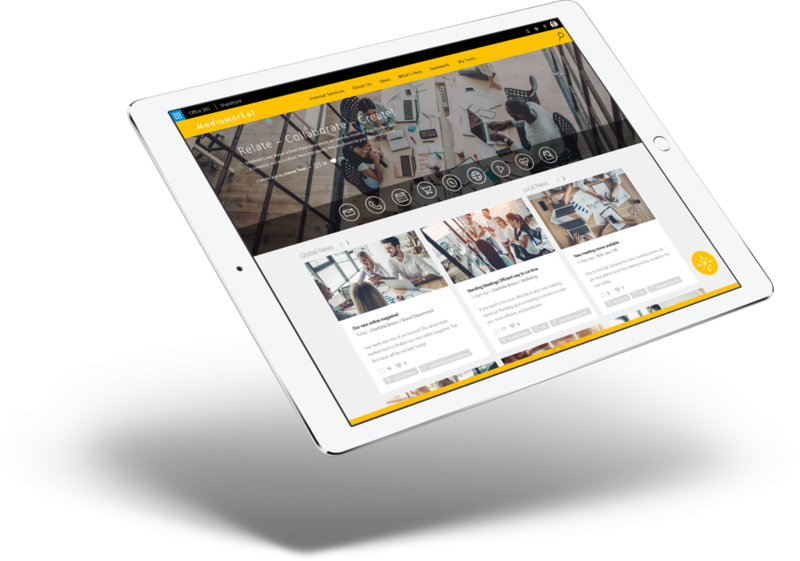 With the ability to use it side-by-side with classic SharePoint, and the additions that Valo Modern brings on top of it, I am sure this is the last intranet we’ll ever need." Do you want to see how your last intranet you'll ever need could look like? Complete the form to get your personal Valo Modern demo! Valo Intranet was born when intranet and SharePoint experts at Blue Meteorite decided to stop re-inventing the intranet wheel over and over again. Coming to the third generation, Valo is better than ever.